SO YOU CAN SAY THIS WHEN YOU'RE DONE: "What an amazing before and after difference. This is the best DIY enhancement ever to our garage. Larry L, Very Happy Customer!" WE MAKE IT EASY FOR YOU TO DO ALL OF THE ABOVE! You can paint your garage floor or commercial floor by going to your local Home Improvement store or paint store, picking out a color from one of the name brand companies and simply roll it on. If you take this approach and unfortunately many people do, your floor won't look half as good as the ArmorGarage floor above. Nor will it last a fraction as long. The destructive forces of abrasion from your tires will guarantee that, we show you exactly how that looks in the MUST READ TAB above. 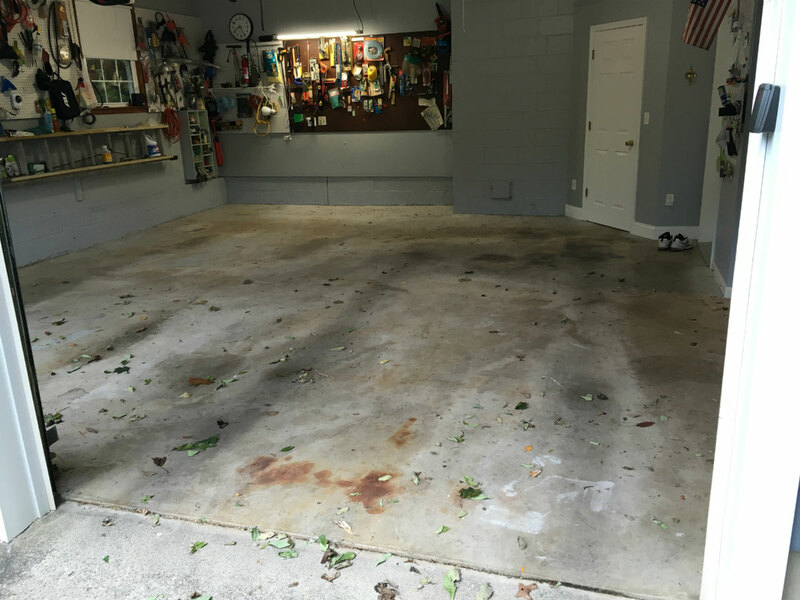 If saving a few dollars on your epoxy garage floor coating is your primary concern or main criteria in choosing a product, you're making a big mistake. Armor Chip garage floor epoxy kits are designed with the first time epoxy novice in mind. We make it easy and straight forward for you to get professional results at a fraction of the cost. This is not the case with Cycloaliphalic epoxy floor coatings which bubble up as you apply it requiring you to use a leaf blower to blow out the bubbles as you go. This can cause all sorts of issues. We use only 100% pure Aliphatic epoxy with military grade resins, hardeners, polymers, pigments and absolutely no water to make our epoxies. 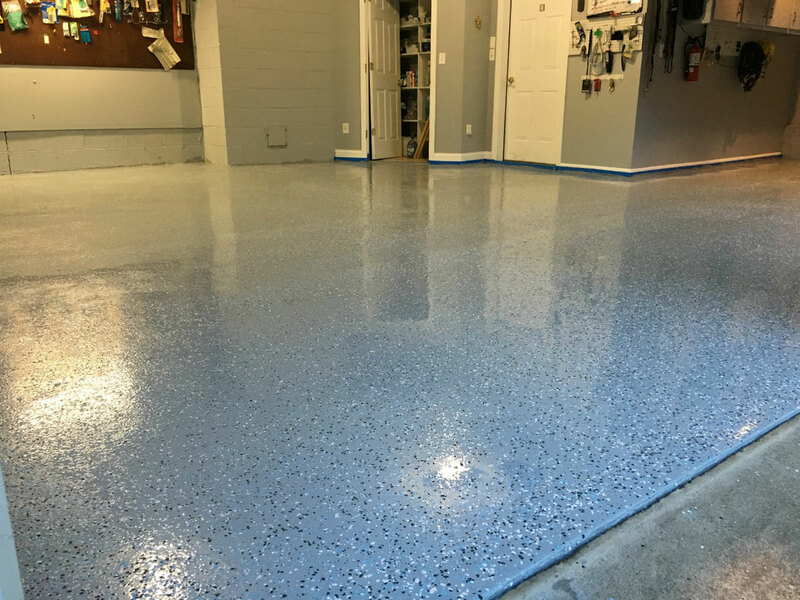 Which means you get the best looking high gloss garage floor with no bubbles that is Hot Tire Lifting proof and with the best abrasion/durability rating they're the only garage epoxy floor kits with a 5 year guarantee against wear. Armor Chip comes complete with Everything you need to finish your floor to a beautiful high gloss Terrazzo like finish including the protective topcoat and free shipping. See what those other low priced kits really cost when you add in the topcoat, the proper amount of chips, an equally thick coating and shipping on our Epoxy Comparison Chart. Do the comparisons and you'll see Armor Chip Floors not only look better but dollar for dollar are by far the best quality & value when you really know what you're getting! Only Armor Chip provides you with our unique calibrated notched squeegee to accurately spread the epoxy to the correct thickness. No guess work and no thin spots that can fail! We also include 2-rollers, mixer, nonslip additive, 8lbs of color flakes, 1- full gallon of etching solution, military grade epoxy and urethane fortified topcoat. 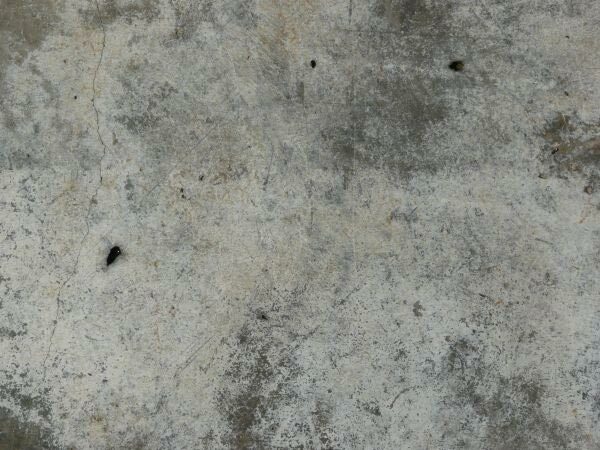 Armor Chip Floors are guaranteed for 10 years against "Hot Tire Lifting" and related damages such as yellowing, fading and cracking! Armor Chip is the ONLY product of it's kind guaranteed against Wear For 5 Years! Don't be fooled by exaggerated so called lifetime guarantees that exclude everything but peeling and are next to impossible to comply with. Plus they offer no guarantee against wear because they can't, their abrasion loss ratings are too high which means their epoxies are too soft. Only Armor Chip provides you with 8 lbs of high quality colored chips and two coats of Ultra Clear urethane fortified protective top coating that will never yellow or fade. Unlike Cycloaliphatic and water based epoxies that will yellow no matter what additive you add to them. Did you know that the "Plastic Chips" do not fully embed themselves into the epoxy! So Chips that are not "Sealed In" with a topcoat have tiny exposed raised edges that will trap dust, dirt, oil and grease. You will be scrubbing your floor to get it clean versus simply wiping it clean in minutes with a damp mop or rag on a Tee stick! Tires on your car can reach temperatures up to 180 degrees! What do you think is going to happened to those surface exposed plastic chips without a protective topcoat when hot tires with the weight of your car are twisting and turning on them. Coating over your epoxy with a clear version of the same epoxy with the same abrasion rating will not solve the problem, it can actually make it worse. Your topcoat must have an abrasion loss rating LOWER than your epoxy for it to be effective. If you've recently coated your floor with any of the other epoxies mentioned above it's most likely dulling and wearing off already, see the Must Read Tab for applying our epoxy over an existing coating. For proof that Armor Chip is tough enough to handle any abrasion from your twisting/turning tires watch this video. It was made by a customer who was so pleased with his Armor Chip results he made a video of his installation. No Big Box epoxy, water based epoxy or any epoxy without a topcoat would survive this unscathed! This is actually much more abusive than your car since it's 3700lbs on much smaller wheels which puts a lot more torque and grinding pressure into the coating as the wheels twist and turn. The floor installed was the Kahki Tan Armor Chip with the Military Grade Topcoat upgrade. Armor Chip can be applied to wood trim, concrete curbing, steps and block walls. Will not run or drip down vertical surfaces. You can also install cove base from www.easycove.com or www.easycove.com and run the epoxy across the floor and up the cove base to form a water proof tub type installation. For workshops or workshop type garages select the single coat Military Grade Topcoat. With an extremely low abrasion loss rating that's the best in the industry this provides added protection via a chemically harder finish when working on a regular basis with heavy rolling tool chests, tools or equipment. Also use the upgraded topcoat when using vehicles such as tractors, ATVs, rubber tracked equipment, golf carts or large boat trailers. Woodworking shops that use stationary type equipment are ok with the standard topcoat. For office spaces with rolling chairs, retail locations with high foot traffic and shopping carts use the upgraded topcoat for best results. Choose from one of our wife approved pre-selected Paint and Chip combinations from the images above or design your own custom Paint and Chip combination. To order chip colors other than what's in our standard packages simply order the kit in the base color of your choice then list the chip colors you want in the "Custom Chip Color Box". For Full Broadcast version please call, full broadcast requires a significantly larger amount of chips and additional topcoat. It also requires a different technique to achieve professional looking results. We want to make sure you know what to do so you do it right. If you can't decide on which colors you want just give us a call and ask for Teri, she's our in house color expert and she'd be happy to go over which colors would be best for your floor. Armor Chip garage floor epoxy comes with everything for a complete job and contains enough material to do up to approx. 550 sf. For larger floors you can buy The Add On Half Kit. See the COVERAGE Tab for more detail. Armor Chip ships Free except to HI, AK or Canada. We have 15 standard epoxy and chip color combinations you can choose from. See the description of each below. You can also choose to make your own color combination. It's simple to do. Just select the kit that has your base epoxy color and then choose the chip colors you want from the Chip Color Chart and list them in the "Custom Chip Color Box". CLICK HERE FOR CHIP COLOR CHART PLEASE NOTE THAT ONLY GREEN GLOW IN THE DARK CHIPS ARE NOW AVAILABLE AND THERE IS A $50.00/LB ADDITIONAL CHARGE. 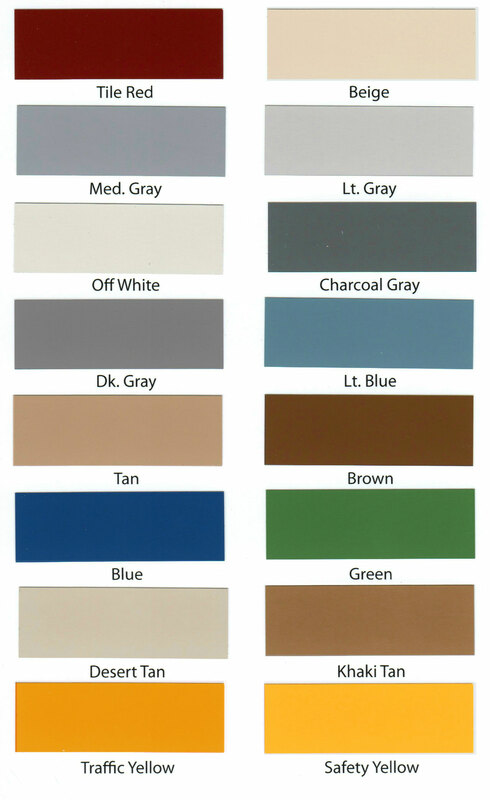 Images above are of our standard color combinations, for custom color combinations select your base color floor epoxy, then click on the Chip Color Chart Link above and select up to 5 chip colors. Order your kit in the base color you desire and then list the chip colors in the Custom Chip Color Order Box and we will process your custom order accordingly. Please allow 2-3 additional days for a custom color combinations. Gray & Lt Gray kits have white, black and light blue chips. Dk Gray & Charcoal Gray kit have black, white and primary blue chips. Beige kit has black, white and brown chips. Red kit comes with additional primer material for proper color coverage and has black, white and tan chips. Tile Red kit(see epoxy color chart) is a design it yourself kit, pick up to 5 different chip colors from the chip color chart. Harley Tan kit has 10lbs of brown, clay, chocolate, white and black chips. Harley Tan Light kit has 10lbs of clay, buff, chocolate, white and black chips. Blue & Light Blue kits have black, white and functional gray chips. Racing Blue kit has black, white, gray and rustic red chips. Harley Gray has Light Gray epoxy with 10 lbs. of neutral gray, charcoal gray, functional gray with hints of black and white chips. Black- Standard black comes with 8lbs of gray white and red chips, optional black comes with 5lbs of metallic silver chips as pictured in the image above. Desert Tan has burgundy, ivory, hunter green and navy chips. Kahki Tan kit has 10lbs of brown, beige, tan and coppertone chips. To order a custom Paint and Chip combination select any one of the kits in the base color epoxy you want. Then in the comment box at the bottom of the checkout page indicate what color Chips you would like, you can request up to 5 different chip colors, we carry every basic color chip you can think of (glow in the dark chips are only available in Green Glow due to EPA restrictions). EXAMPLE OF CUSTOM COLOR ORDER: You like the Light Gray kit but want red, black and white chips instead of the standard colors. Simply select Light Gray as your kit and then enter the chip colors red, black and white in the comment box, we will supply those chips. Each kit will cover up to 550 sf. Rougher surfaces and more porous surfaces will yield less coverage. Lighter colors such as Beige will yield less coverage and it's a good idea to use a primer first when using Beige. White and Red come with a primer to ensure a beautiful Bright White or Bright Red finish without any concrete bleed through or streaks. Always order enough material to cover your floor area plus 10% as a safety factor. Painting a concrete floor can sometimes be like painting a sheetrock wall, we've all had the experience of putting a coat of paint on a wall only to have it disappear completely into the wall and require a second coat. Some floors can be very absorbent so please do not try to order to the exact square footage of your floor. You can order an ADD ON HALF KIT that will provide an additional 250-275 sf of coverageto be sure you have enough material. If you end up not using it just send it back to us for a full refund. Also it's a good idea to have a little leftover that you can put into small jars in case of an emergency. NOTE: if you are using a primer you can expect about a 20% increase in coverage from the epoxy since it is now going over a sealed surface. So if you are slightly over the size of the full kit you can do a primer as an option rather than ordering the add on half kit. 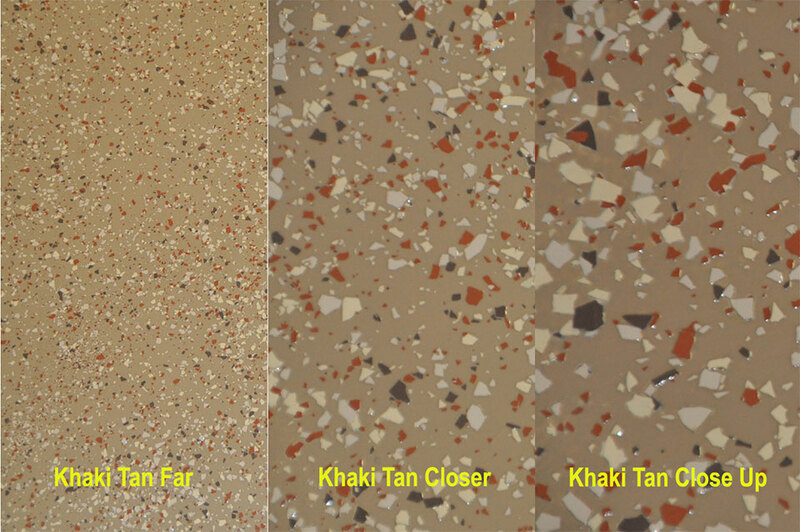 You can mix and match full kit and half kits to get to right match for your floor size. We even have a bulk sized kit which is the equivalent of 4 full sized kits. 8 LBS OF COLORED CHIPS. Two coats of crystal clear urethane fortified protective topcoat. For Fork Lift traffic or other heavy duty usage choose the single coat Military Grade Topcoat Option. Mixing sticks to mix individual cans. 1-unit of non skid additive for areas where additional traction is desired. Won't affect high gloss finish! 1-paddle mixer to mix combined epoxy parts A & B. Our unique system is easy to apply and can be installed by anyone who can paint with a roller. Its simple and easy! 1.Clean/wash the floor well (power washing is preferred for best results)to remove ALL dirt, loose paint and any other contaminants. If your floor was previously coated with an inferior floor epoxy that has failed or is beginning to fail please refer to these set of images on how to properly redo your floor with Armor Chip Floor Epoxy. How To Coat Over An Existing Floor Epoxy. Please note that if a major percentage of the floor is peeling or flaking off it means that its only a matter of time before the entire floor fails and it's best to completely remove the coating. Apply epoxy in floor temperature range of 55-95 degrees. Do not apply in heavy rain. 2. Mix our supplied environmentally safe floor etching solution with water per packaged instructions. Apply and scrub in well with a stiff shop broom, let stand for 10 minutes then rinse thoroughly. Let dry 24-48 hrs to be sure concrete is completely dry. For best results floor must be completely clean, dry and have a slightly rough feel to it. A second etching may be necessary for new floors due to large amounts of curing residues at the surface or older floors that are extra dirty. See our Acid Safe Etching Kit for additional etchings. If using the Acid Safe Etching Kit prior to rinsing acid off sprinkle 2 boxes of the supplied TSP over the floor, brush in to neutralize the floor and then rinse thoroughly. 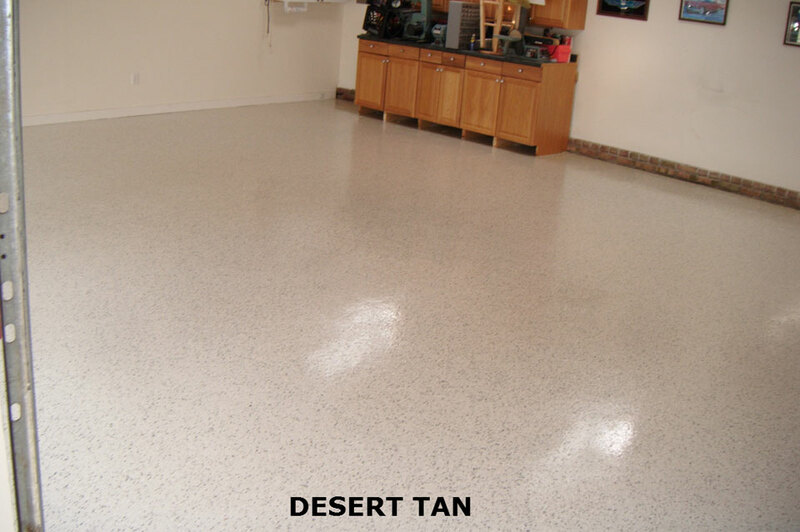 It is extremely important that your garage floor is absolutely clean and properly etched. If your floor was power troweled you will most likely have to do two etches to open the pores of the slab. This is how your floor should look like prior to coating with any type of epoxy paint. If your floor looks like this STOP and power wash and etch again! If you are grinding your floor it is still recommended that you etch the floor as you are rinsing off the dust from grinding, this will ensure the concrete pores are clean and open. If you do not intend to rinse the grinding dust off then etching is not necessary. Our epoxy will permanently bond into the open pores provided by etching, grinding or a combination of both. If applying over an existing coating see the link at the bottom of the MUST READ page for instructions on how to do it correctly. 2B. If using the epoxy flooring primer mix 1/2 gallon of A & 1/2 gallon of B and roll onto floor. Repeat until done. Allow primer to dry aprox. 6-7 hrs but no more than 24 hrs. After 24 hrs lightly sand with 100 grit to rough up. If using Low VOC primer the ratio is 4 parts A to 1 part B. 3. Mix the contents of each individual can of the two part epoxy and then mix the two parts together at a 2 parts A to 1 part B ratio. Use two measured containers to get accurate amounts of each epoxy part(2:1 ratio). Pour the container of A and the container of B into a 5 gallon bucket and mix thoroughly for 3-4 minutes. DO NOT mix all the epoxy at once, this is not like store bought epoxy paints that have a pot life of up to 8 hours. Armor Chip Garage Floor Epoxy is pure Military Spec epoxy that works on 100% catalytic reaction so the more you mix the more reaction you get. Armor Chip has a pot life of about 45 minutes. If you mix all the epoxy at once you will have a bucket of concrete in about five minutes. We recommend doing your floor in 3-4 batches per kit, the smaller batches will allow you to apply the epoxy and chips without rushing and still have plenty of work time left over as a safety margin. Apply a bead of the mixed base color coat from the container in a left to right direction directly to the floor do not use a roller pan. Spread evenly over a 4-5 ft wide strip(you can do much larger sections if purchasing the optional spiked soles) with supplied notched squeegee. Then roller over to smoothen. Armor Chip Epoxy will automatically be at the proper thickness. Don't worry about the epoxy drying on the roller or squeegee, when you mix the next batch up it will reactivate the epoxy for another 45 minutes of pot life. 4. While the floor epoxy is wet, apply the supplied color chips by simply tossing them slightly up into the air and at a 45 degree angle away from you so that they freely rain down onto the epoxy in an even pattern. We give you plenty of chips do achieve the look your eye thinks is best. You can use as much of the chips as you want without worrying about running out. Avoid tossing too many chips at a time so that you don't wind up with piles of chips which will spoil the the look of your new floor. Tossing a little at a time is best. Leave the last 6 inches of the epoxy without chips. You will overlap the epoxy from the next section onto this area and then apply the chips. All the sections will blend together to form a single monolithic seamless finished coating. If purchasing the spiked soles you can see an alternate method a customer shared with us for spreading the chips that works amazingly well on this page below. 5. Once you have completed the first section repeat steps 3 & 4 until done. Note: After the first section you may do larger areas as you get comfortable working with the epoxy. You should be done painting and applying chips in about 2 hrs per kit. Note: for large areas use our spike shoe bottoms which allow walking on the wet epoxy. Use Xylene for any clean ups(available at Home Depot or Lowes). 6. Let the floor epoxy & chips dry to the touch, usually in approximately 5-6 hrs, you can let the epoxy cure overnight also. Once dry to the touch sweep the floor good with a stiff shop broom or shovel with plastic edge to remove any loose chips or any chips that are sticking straight up. Don't worry about scratches, any scratches in the epoxy will disappear when the clear coat is applied. Apply half of the clear topcoat to seal in the chips and magnify the beautiful high gloss finish. The chips themselves give the floor some texture but if you desire to use the non skid additive supplied for added traction, mix it right into the second final clear coat. Allow first coat to dry to the touch before applying second coat. Clear coat dries to a touch/walk on, in about 2-3 hrs(you can move all your stuff back in at that point). If you are using the upgraded Military Topcoat you only have to do one coat. Apply the Military Topcoat as soon as the floor epoxy is dry to the touch or first thing the next morning for best results. Do not exceed 24 hrs for either topcoat. Military Topcoat dries to the touch in 5-6 hrs to walk on. Let either topcoat cure for 36-72 hrs before driving on it. That's it! FIRST GET A PLASTIC CONTAINER, PREFERABLY ONE WITH A HANDLE. DRILL SOME HOLES IN THE BOTTOM, ABOUT 3/8" DIAMETER. NOW FILL THE CONTAINER HALFWAY WITH CHIPS, HOLD CONTAINER SIDEWAYS UNTIL YOU ARE IN POSITION THEN TURN CONTAINER UPRIGHT SHAKE CONTAINER WHILE WALKING IN THE EPOXY WITH YOUR SPIKE SOLES(MUST HAVE THE SPIKES). THE CHIPS WILL NOT COME OUT UNTIL YOU START SHAKING AND THEY WILL FALL STRAIGHT DOWN OUT OF THE CONTAINER. ONCE YOU'VE DONE A SECTION TAKE A STEP BACK AND LOOK FOR BARE SPOTS, IF YOU HAVE A SECOND PERSON THEY CAN ACT AS A SPOTTER. FOR BARE SPOTS JUST WALK UP TO THEM IN YOUR SPIKED SOLES AND ADD A PINCH OF CHIPS WITH A LITTLE SHAKE OF THE CONTAINER TO FILL IN. AS YOU CAN SEE THIS METHOD RESULTED IN A BEAUTIFUL CHIP PATTERN THAT IS AS GOOD AS IT GETS. ARMOR GRANITE KITS INCLUDE SPIKED SOLES, WITH ARMOR CHIP THEY ARE PURCHASED SEPARATELY. 1. Epoxy is 100% solids military grade aliphatic epoxy as opposed to water based or hybrid cyclioalipahatic epoxies. 2. Topcoats are unique and different from epoxy. They are urethane fortified and have abrasion loss ratings of 20mgs for the standard topcoat and 4mgs for the military upgrade topcoat. What that means is that you are getting the best protection in the industry against tire abrasion that causes dulling and wear spots. We show an example of this on the web page. We recommend you read the paragraph in red on the web page for a full understanding of what a topcoat is and what it's supposed to do. It is very important that you know the difference between topcoats and epoxies. No epoxy can be made into a topcoat. That is just marketing hype and a waste of your money. We offer a straight 5 year guarantee on everything including wear, no other company will guarantee your floor against wear. 3. Coverage is up to 550 SF for Armor Chip kits & up to 500 SF for Armor Granite kits. We recommend that you allow a 10% safety factor when determining how much product to buy. Add on half kits are available for both Armor Chip and Armor Granite. Please note that lighter colors such as Beige will yield less coverage. 4. Armor Chip is 19 mils thick with 1 coat of epoxy and 2 coats of topcoat. Armor Granite is 23 mils thick with one coat of extra thick epoxy and 3 coats of topcoat. When using the military grade topcoat one coat is all that is required with either kit. 5. Armor chip comes with 8lbs of color flakes. Armor Granite comes with 20lbs of color chips and the spike soles to make spreading the chips easier. 6. Both kits come with a full gallon of etching solution to properly clean your floor, calibrated notched squeegee(not a simple flat squeegee), 2- rollers, mixer, mixing bucket and nonslip additive.Free Shipping is included for all our epoxy kits. 7. You can choose one of our standard epoxy and chip color combinations or you can customize your kits any way you want with any color combination of epoxy and color chips. We have over a dozen epoxy colors and 500 different colors of chips. 8. We strongly recommend you read our information on prepping your floor properly. It is extremely important that your floor is clean and dry with the pores opened up. If your floor has been previously coated and failing badly you must remove it completely. If your previous epoxy was a good quality epoxy it should just be worn out and can be coated over with one of our kits using our bonding primer first. All the above info can be found on the "How To Prep And Paint Your Floor Videos" page. Epoxy should end at the inside edge of the garage door. 9. Pot life is approx 45 minutes. We recommend not mixing more than one gallon at a time for each person rolling. This is pure military grade resins and hardeners, the more you mix the more catalytic reaction you get. Low quality epoxies typically have a very long pot life of several hours. This is your clue to avoid that epoxy at all costs. 10. Clean up is with Xylene(available at HD, Lowes or ACE Hardware), be sure to clean all spills or splatters off anything you don't want painted. Once the epoxy dries it can only be removed via grinding. The following is a list of questions we get asked the most. If you have a question that is not addressed here feel free to give us a call or send us an email. How do I order different color chips than what's standard with your kits? In the "Custom Chip Color Box simply list up to 5 colors that you choose from the Color Chart. There is no extra charge for custom colors. My floor is bigger than the 550 sf coverage of the Armor Chip Kit. What do I do? How long do I need to wait before coating a new slab and do I still need to etch it? New slabs need to cure for 28 days minimum and they need to be etched. In fact we like you to do an extra strong etch to make sure we burn out all the curing residues at the surface. You can do this buy simply buying a gallon of Muriatic Acid and mixing it with our etching solution. 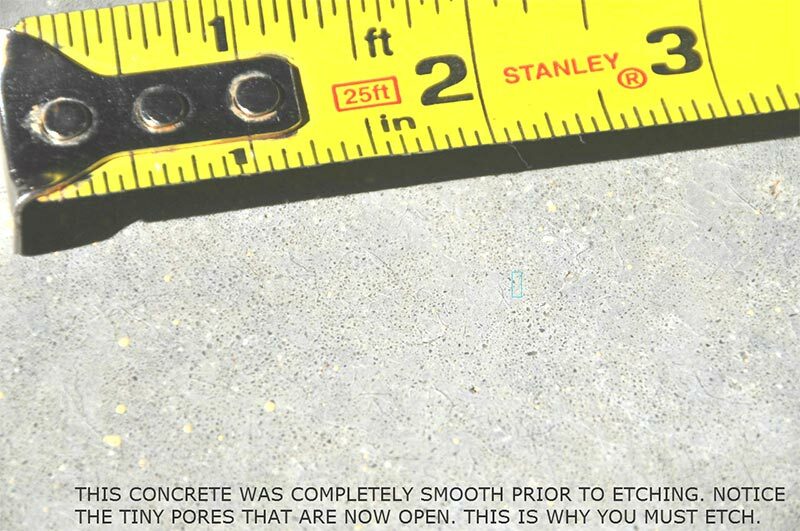 This will give our etch solution a little extra zing to clean and open the pores of your concrete slab. As you will undoubtedly see elsewhere on the site this is extremely important, it allows the epoxy to get into the open pores and make a molecular bond with the concrete. How long do I need to let primer dry? The Primer will dry in 5-8hrs depending on temperature and humidity conditions. Once the primer is dry to the touch you can apply the epoxy. Do not let more than 24 hrs pass before applying the epoxy. Otherwise you will need to lightly sand the primer with 120 grit to rough up the surface. Should I fill in the saw cuts or expansion joints? No we recommend that you do not. The last thing you want is to have a crack done the middle of your new high gloss epoxy floor. Once you've applied Armor Chip or Armor Granite the saw cuts will add dimension to the floor and they will look like big slabs of stone. If your floor is older than 10 years it's probably ok to fill them since the floor is done settling. But you never know for sure what can happen. Can I extend the epoxy out past the Garage door? No we don't recommend that. The epoxy should end at the inside or outside edge of the garage door. When should I fill in the cracks and will the epoxy fill the cracks in? If the cracks are surface hairline cracks the epoxy will cover them. If the cracks are deep they may run the depth of the slab in which case you will consuming a lot of expensive epoxy to fill them. Better to use either the Crack & Joint Compound or the Instant Crack Filler. Crack & Joint Compound goes in before the cleaning and etching, the Instant Crack Filler goes in after. How long do I need to let the floor dry? It's a matter of temperature and humidity, you should let it dry for 48 hrs to be sure all the moisture has dried out of the floor. When can I put the topcoat down? As soon as the epoxy dries to the touch, usually the next morning. When can I put my stuff back in my garage? The topcoat will dry to the touch in 4-5 hours at which time you can walk on it and put your stuff back in, keep the car and other heavy rolling objects off for 3-4 days. Should I get the Military Topcoat? We always recommend the Military Topcoat. It's less work since you do only one coat and it's a much harder finish that will keep your floor looking new for 10-15 years even in harsh climates with lots of road salts. If you have smaller vehicles that go in and out of the garage seldom and you live in a mild climate then you're fine with the standard topcoat. Next to properly prepping the floor the topcoat is the most important thing. I had an accident and scratched my floor, what can I do? Scratches are easily fixed, see the Care & Maintenance page for the answers. I've had my floor for many years and it's finally starting to wear out, what do I do? Easy just give a light sanding and roll on a new topcoat, that will bring the floor right back to new. The epoxy and chips should stay indefinitely. In actual hours it's not much at all but since you have dry times you should allow 3 days to get the job done. Total working hours should be no more than 4-5 hours. Can I paint my curbs? You can coat your curbs whether they are concrete or block. Just allow a little more material when doing block curbs since they absorb more material. You can also do wood molding and steps in your garage. This is the must read page cause it's full of information designed to keep you out of trouble or get you out of trouble. You'll be seeing this information again elsewhere on the website, it's that important. Also if you haven't done so yet we encourage you to watch the video on the Home Page. It's a video of a car turning and twisting into a tight parking spot on the same floor below. It's great evidence how tough our military grade topcoat in that after 8 years of dead weight tire twists and turns it still looks brand new! If you previously coated your floor with a water-based floor epoxy or any other type of epoxy without a true urethane fortified topcoat that's under 10 mils thick, it's more than likely your floor already resembles the worn out Blue Arrow in the images below. The biggest mistake you can make is not using a topcoat! Did you know that ALL solids based epoxy coatings are NOT UV stable? Without a polyurethane epoxy topcoat, ALL solids based epoxies will yellow and lose their gloss. Real Topcoats are much more expensive to manufacture and have a much harder finish than epoxies! Moreover, any topcoat that does not have a 20mg or less abrasion rating will fade and wear out prematurely�that's an indisputable epoxy fact. This is especially true if a company's topcoat is just a clear version of their epoxy. This offers no additional abrasion or UV protection than the epoxy without a clear coat. Simply adding in a UV additive does not make an epoxy a topcoat! In other words, it's a waste of time and money to apply a clear epoxy over your color epoxy with chips. To be a real Topcoat it must be polyurethane fortified and have an Abrasion Rating LESS THAN the epoxy it's coating! Our standard topcoat as measured by the industry standard Taber CS-17 abrasion loss test has an abrasion loss rating of 20mg and the Military Grade option has an amazing 4mg loss rating(the lower the better), no other topcoat comes close. Typical epoxy abrasion loss ratings are 24-40mgs or higher which makes them much much softer our Armor Chip finish. This means they will wear out faster. To sum it up polyurethane is to epoxy what rebar is to concrete. Leave out either of those items and both epoxy and concrete will fail, it's just a matter of when. DON"T LET THIS HAPPEN TO YOUR FLOOR If you've got to us too late CLICK HERE to learn how to coat over an existing floor epoxy coating or even regular floor paint with one of our epoxy kits. Read this post if you're thinking about a full broadcast epoxy floor?